Toronto, Ontario--(Newsfile Corp. - June 26, 2018) - Appia Energy Corp. (CSE: API) (OTCQB: APAAF) (FSE: A0I) (FSE: A0I.F) (FSE: A0I.MU) (FSE: A0I.BE) (the "Company" or "Appia") is pleased to announce that the summer exploration work (the "Program") currently being carried out on the Alces Lake Property (the "Property") in northern Saskatchewan has, in addition to enhancing the existing zones of REE mineralization on the property, resulted in the recognition of two new zones, collectively known as the Charles and Bell Zones, which feature high levels of radioactivity and highly anomalous, visible concentrations of monazite. 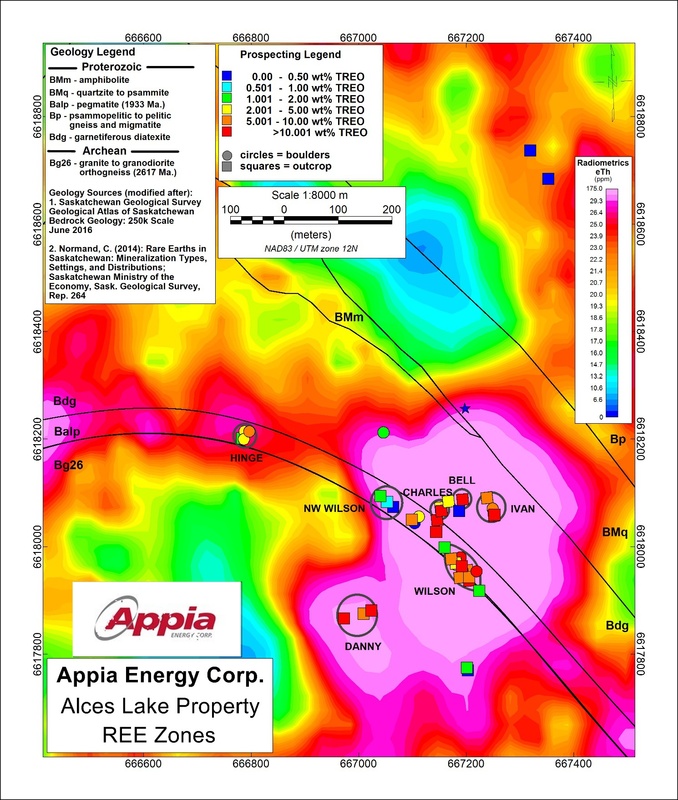 The Alces Lake Property encompasses some of the highest-grade total and critical rare earth element ("REE") mineralization in the world, hosted within seven broad surface showings that remain open in all directions (see *Note below). The Property is 1,518 hectares (3,751 acres) in size. The Charles and Bell zones which were manifested in the field earlier by individual anomalous samples, were enhanced recently by trenching and following-up previously sampled areas with minimal outcrop exposure. Samples taken in 2011 and 2010 from the Charles and Bell zones returned 16.1 wt% and 17.6 wt% Total Rare Earth Elements ("TREE"), respectively. The high levels of radioactivity (10,000 to 30,000 counts-per-second ("cps")) in the Charles and Bell zones are consistent with and/or higher than the original sample locations. See Figure 1 for location of the Charles and Bell zones. The Charles zone is currently defined over an exposed trench area of 10.1 m by 1.5 m, separated into two sub-zones of high levels of radioactivity measuring 4.8 m by 1.5 m and 1.5 m by 1.0 m. The Bell zone is currently defined over an exposed trench area of 3.6 m by 2.2 m. Both zones remain open in all directions and the perimeters are covered by overburden. Mr. James Sykes, Appia's Vice President of Exploration and Development comments; "We are very excited with the identification of these new zones of REE mineralization which contain high levels of radioactivity and visible monazite. The most recent results from the Charles and Bell zones confirm our belief that the Alces Lake REE system is more extensive than previously indicated from the results of our earlier work on the Property; however most of the Charles and Bell Zones remain hidden from view beneath the overburden. Phase I of the Program, consisting mainly of trenching and overburden stripping, is actively underway and will be fundamental to discovering and delineating additional REE-rich zones." Phase II of the Program, which will consist essentially of diamond drilling, is expected to commence in late July. Geochemical and radiometric results will be announced as they are received and reviewed by the Company. The Company is hopeful that it will be in a position to produce a NI 43-101 compliant Inferred Mineral Resource estimate by year end 2018. All necessary permits for the Program are in-hand. A lead-shielded RS-125 scintillometer was used to measure radioactivity readings. The reader is cautioned that Appia uses scintillometer field readings only as a preliminary indication of the presence of radioactive materials (uranium, thorium and/or potassium), and that scintillometer results may not be used directly to quantify or qualify radioactive mineral concentrations of the rock samples measured. Background radioactivity measured in the field ranges from 100 cps to 2,500 cps. Elevated radioactivity is defined here as at least 2x background values or greater than 500 cps if background radioactivity ranges from 100 to 250 cps. *Note: The Alces Lake REE grades were compared with global REE deposit grades. The global REE deposit information was derived from publicly available information as of January 31, 2018, from individual company websites, SEDAR technical report filings, and the Technology Metals Research Advanced Rare Earth Projects Index (http://www.techmetalsresearch.com/metrics-indices/tmr-advanced-rare-earth-projects-index/). In addition, the Company would like to invite the general public to join a live public webcast presentation on Wednesday June 27, 2018, from 8:30 AM — 9:00 AM (EDT, UTC -4:00) as part of the John Tumazos Very Independent Research Metals and Natural Resources Conference 2018. The conference will be held at the Kimisis Tis Theotokou Greek Orthodox Church, 20 Hillcrest Road, Holmdel, NJ 07733, Wednesday June 27 and Thursday June 28. Appia is a Canadian publicly-traded company in the uranium and rare earth element sectors. The Company is currently focusing on delineating high-grade critical rare earth elements ("REE") and uranium on the Alces Lake property, as well as prospecting for high-grade uranium in the prolific Athabasca Basin on its Loranger, North Wollaston and Eastside, properties. The Company holds the surface rights to exploration for about 51,164 hectares (126,430 acres) in Saskatchewan. The Company also has NI 43-101 compliant resources of 8.0 M lbs U3O8 and 47.7 M lbs Total REE Indicated and 20.1 M lbs U3O8 and 133.2 M lbs Total REE Inferred in the Teasdale Zone plus 27.6 M lbs U3O8 Inferred in the Banana Lake Zone in the historic mining camp of Elliot Lake in Ontario (previously reported in the Company's news release dated August 14, 2013). The resources are largely unconstrained along strike and down dip. Appia's technical team is directed by James Sykes, who has had direct and indirect involvement with over 450 M lbs. U3O8 being discovered in five deposits in the Athabasca Basin. Appia currently has 52.3 million common shares outstanding, 65.3 million shares fully diluted. The technical content in this news release was reviewed and approved by Thomas Skimming, P.Eng, a Director of Appia, and a Qualified Person as defined by National Instrument 43-101. Cautionary Note Regarding Forward-Looking Statements: This News Release contains forward-looking statements which are typically preceded by, followed by or including the words "believes", "expects", "anticipates", "estimates", "intends", "plans" or similar expressions. Forward-looking statements are not guarantees of future performance as they involve risks, uncertainties and assumptions. We do not intend and do not assume any obligation to update these forward- looking statements and shareholders are cautioned not to put undue reliance on such statements. Figure 1: Location of the 7 REE zones on the Alces Lake property. The Charles and Bell zones are the newest identified zones to date.